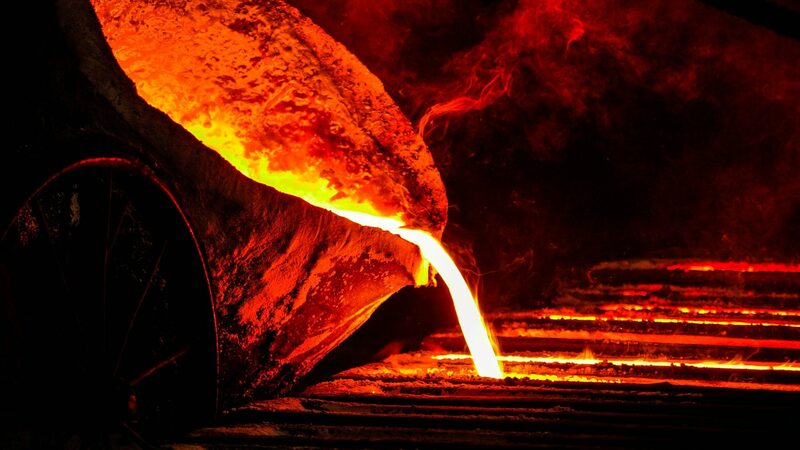 Featured above: Iron in a foundry, much as it exists in Earth’s outer core. My apologies for doing this two episodes in a row, but further travels have made it impossible for me to post some of these show notes on time! I’ll work on getting them up before the next episode, and I haven’t forgotten about Manganese, either. It’s that time of year! Humanity has known iron for a very long time. It’s one of those elements that doesn’t really have “a” discoverer, because it’s been in our hands for about as long as we’ve had opposable thumbs. But it wasn’t until the Industrial Revolution that we really unlocked some of iron’s most potent properties, making it useful in the construction of railroads, steam engines, and buildings. One such building, constructed for the 1889 World’s Fair in Paris, is the Eiffel Tower. At the time, it was the tallest structure in the world, unseating the aluminum-tipped stone obelisk that is the Washington Monument, and holding that title until 1930, when it was dethroned by the chrome-plated Chrysler Building. In a city filled with iconic cathedrals, museums, and monuments, the Eiffel Tower stands above them all, making it the most distinctive feature of the Parisian skyline. This did nothing to stop the project, of course. All the legal paperwork had been filed by that point anyway. We, too, are inescapably caught in the long shadow of iron. It might be possible to go your entire life without encountering beryllium or scandium, but iron is ubiquitous in our lives: In our tools and in our walls, the core of our planet and coursing through our veins. But we don’t need to take any cues from de Maupossant — iron’s omnipresence is something worth celebrating. De Maupossant was, in general, kind of a pessimistic Guy. He wrote his own epitaph, which reads, “I have coveted everything and taken pleasure in nothing.” I suppose, then, he would not even find joy learning that, from where his gravestone lies, in Montparnasse Cemetery, it is impossible to see the Eiffel Tower. Today, we’re forging ahead with iron. One reason humanity has worked with iron since our earliest days is because we could acquire the resource without needing to go mining for it. Iron was a gift from the heavens. That’s not some tale from mythology, or a poetic turn of phrase. These chunks of iron are the ultimate product of nucleosynthesis. We’ve discussed nucleosynthesis before. That’s simply what it’s called when two elements are smashed together to make one heavier element. It’s a process that’s constantly happening inside every star, and it’s such an energetic reaction that we can feel its heat and bask in its light from 150 million kilometers away. But iron is the last stop. Making anything heavier than iron costs more energy than it generates, so the star just can’t do any more. Of course, atoms much heavier than iron do occur in nature, but their origins are stories for other episodes. Other stars lived and died in our neck of the galaxy long before the sun. They generated the raw material that makes up everything in the solar system, and because of this bottleneck at the stellar element factory, a lot of that material happens to be iron. It is, in fact, so abundant that Earth encounters tens of millions of iron-rich meteors every single day. Most of those burn into dust while sailing through the atmosphere, but about five percent of them survive the trip and strike the planet’s surface, leaving behind a meteorite rich in stone or iron. Side note: Meteoroids fly through outer space. When they enter Earth’s atmosphere, they produce a bright flash of light called a “meteor.” That’s what people sometimes call a “falling star.” If the entire thing doesn’t burn up in the atmosphere, whatever comes crashing to the ground is called a “meteorite.” It’s a little confusing at first, but you can keep it straight by remembering that meteoroids exist in space, like asterOIDs. Meteorites are found in the ground, like graphITE, or hemaTITE. And when it’s turning from one of those things into the other, the result is a meteor. Meteors can be truly spectacular events, like in 2013 when the 20-meter-wide Chelyabinsk Meteor lit up the Russian skies with a blindingly bright fireball and sent a glass-shattering shockwave across the countryside. Rarely — about once every 200,000 years — the Earth is struck by a meteor large enough to have a catastrophic effect on the planet’s inhabitants. But the vast majority of the time, these collisions go unnoticed. And technically speaking, the biggest catastrophe involving Element 26 is something we should all be very grateful for. Even if we weren’t being constantly pelted with the stuff, there’s a lot of iron on our home planet. After all, the Earth is just another body hurtling through space, made of the same material as our local meteoroids and asteroids. When our planet was only 500 million years old, all of its material was pretty evenly distributed. If you were to investigate a scoop of earthen material, regardless of where on the surface or how deep underground you got it from, you would find the same elements in the same amounts, more or less. But then, some of those elements began undergoing radioactive decay, and in the process, they warmed things up. By a considerable amount. Enough that the entire planet became one enormous ball of liquid hot magma. Scientists call this time in Earth’s history the Iron Catastrophe. They didn’t give it that name because it was a huge disaster. Quite the opposite. Life on Earth might not be possible at all if this hadn’t occurred. Going back to its Greek roots, the word “catastrophe” simply means “turning point,” and that’s what it means in this context.5 Once the Earth’s core was established, there was no going back. This invisible field does much more than allow compasses to point north. It’s our planetary armor against the onslaught of charged particles that the sun is constantly hurling in all directions, while still allowing light and heat to pass through. If you’re wondering just how important that really is, look toward the desolate surface of Mars. The Red Planet may have held an atmosphere much like our own, once upon a time, but without a magnetic field, that blanket of air was stripped into outer space like so many shingles in a tornado. So here we are, floating on a molten sea of iron and gathering more every day on our journey around the sun. Despite this embarrassment of ferrous riches, fora long time, we didn’t use it very often. The majority of the iron we use today is mined from the veins of the Earth where Element 26 is plentiful, but it’s trapped in its ore form. It must be refined before it can be of any use, and it was a while before we learned just how to do that. Bronze, rather, was the weapon of choice for armies around the world. An alloy made of copper and tin, bronze is a pretty hard metal. Even after various civilizations discovered where and how to mine iron, bronze remained the superior choice. It holds an edge much better than wrought iron can. Metallurgy continued to advance as a science, and the refining methods discovered during the Industrial Revolution allowed for stronger infrastructure than the world had seen before. Bridges and ships allowed more reliable shipping and transportation, and in the United States, railroads allowed westward expansion to far outpace the Conestoga wagons of old. Of course, it’s not all upside. We can’t really talk about iron without mentioning rust. Rough, red, and a potent symbol of ruin, rust is a result of the oxidation process. It’s an inescapable consequence of existing on a wet and airy world. But why, then, is iron the metal most strongly associated with rust? Plenty of other metals are commonly used in the modern world — aluminum, magnesium, titanium, many others — but iron is the only one with a reputation for degrading like rotten wood. It’s not that those other metals don’t oxidize. They do, and sometimes their oxides can be as useful as the metal itself, as we saw with titanium. Often, the oxides actually help the pure metal maintain its structural integrity by forming a hard and practically impenetrable shell on its surface. But iron really loses out in this regard. Instead of binding tightly to the parent chunk of iron, ferrous oxide expands and flakes off. That leaves the underlying layer of iron exposed, so then it starts to rust, expand, flake off, and expose the layer beneath that. This doesn’t happen overnight, but neither does it take very much time for unprotected iron to degrade. Rust is often a nuisance. It might seal a lock shut or slowly ruin the body of a car. But the consequences of poor maintenance can be far more devastating than that. On December 15, 1967, the Silver Bridge, which spanned the Ohio River, collapsed in the middle of rush hour because a single eye-bar had developed a rusted crack less than one tenth of one inch deep. Forty-five people died. Once the reaction kicks off, it becomes self-sustaining, and it generates so much heat that the iron melts. It’ll almost certainly burn its way through whatever vessel is holding it, like the xenomorph’s blood on board the Nostromo, so make sure you have a hefty bucket of sand underneath. I’d like to reiterate that this is not the kind of prank that modern-day audiences will find terribly amusing. But, if you do ignite thermite in a highly controlled environment, it’s actually a pretty good way to acquire an iron sample of your own creation for your element collection. It won’t be the cleanest sample in the world, but it should be pure enough for the discerning collector. If it’s not, there are of course countless commercial sources of highly pure iron that make it easily accessible. If that’s just a bit too straightforward for you, but you also don’t want to light a 2,000-degree-Celsius incendiary, there is an easier way. Take some breakfast cereal, especially the kind that advertises how well fortified it is in vitamins and nutrients, and grind it into a very fine powder, perhaps in a blender. Then, run a magnet through the powder. It will pull iron filings right out of your food, all ready for display alongside manganese. While you’re at it, you might as well put the magnet in the case, too, because that almost certainly contains a good amount of iron, too. Element 26 doesn’t find its way into your balanced breakfast as some kind of contaminant. It’s in there because, once again, we’re working with an element that your body requires in order to stay healthy. Hemoglobin is a complex compound of iron that almost every animal’s red blood cells use to transport oxygen around the body. A deficiency of hemoglobin is known as anemia, and can leave a person feeling tired and cold, as well as be a symptom of other diseases, like malaria. I’m no doctor, but if that sounds like you, maybe you’ll want to make sure that your body is collecting enough iron every day before you start hoarding it for display. Thanks for listening to The Episodic Table of Elements. Music is by Kai Engel. To learn about the iron pillar that’s stood for thousands of years without rusting, or about the rogue geoengineer who tried to save the world by dumping iron sulfate in the Pacific Ocean, visit episodic table dot com slash F E.
Next time, we’ll catch the blues with cobalt. This is T. R. Appleton, reminding you that Ironic was released in 1995, so Alanis doesn’t need anyone else educating her on the definition of irony. Rethinking Architecture: A Reader In Cultural Theory, p. 172. Neil Leach, 1997. The Los Angeles Times, Glory In Uselessness : The Eiffel Tower: Joke’s On Its Critics. Stanley Meisler, April 23, 1987. The New Astronomy, Stellar Nucleosynthesis. P. R. Warren, 1972. Pittsburgh Supercomputing Center, Crystal At The Center Of The Earth. Michael Schneider. Cosmos Magazine, What Creates Earth’s Magnetic Field? Vishnu Varma R Vejayan, May 1, 2017. What Caused The Iron Age? Clayton E. Cramer, December 10, 1995. Normally I wouldn’t link to a student paper like this, but it’s well-researched and cited. Chemicool, Iron Element Facts. Dr. Doug Stewart, October 6, 2012. New England Historical Society, Six Historic College Pranks And Were They Were Played.